In partnership with organizations such as the Atlanta HBCU Alumni Alliance, Tradition® is pleased to announce the 2019 #MyHBCUGiveback Challenge, an initiative focused on making an impact at the college level. This effort seeks to encourage HBCU alumni and supporters to further strengthen attendance through financial donations. We ask for your help as we raise scholarship funds. 1. Donate directly to your HBCU by going to their website. 2. Accept the $5 Giveback Challenge and represent your school of choice by giving to the HBCU Alumni Alliance which supports over 100 HBCU's in the form of scholarships. 3. 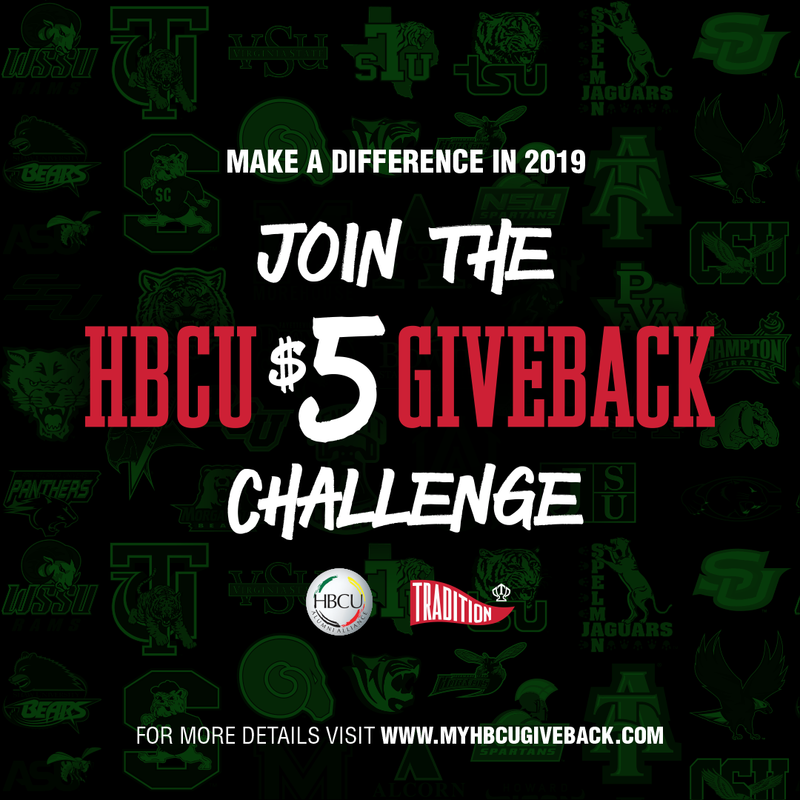 CashApp your $5 Donation to $MyHBCUGiveback. The HBCU Alumni Alliance includes more than 50 Chapters and supports more than 100+ HBCU's. It serves as an advocate for HBCU Alumni Associations by supporting the mission of HBCUs through scholarship fundraising, alumni reclamation and student recruitment in addition to aligning with the National HBCU Alumni Alliances by supporting and participating in programs that promote higher education, encourage healthy living and fighting hunger. With every Tradition® sale, every day of the year, a portion of the proceeds specifically benefits the College or University through our Licensing Agreements. Whether it’s "repping" your alma mater with our gear, securing bragging rights through the $5 Challenge or volunteering, support your HBCU with Tradition®. Q: What is #MYHBCUGiveback Challenge? A: The My HBCU Giveback Challenge is a nationwide effort. The goal is to encourage alumni and supporters to give financially while further raising awareness about the legacy of Historically Black Colleges and Universities. Q: Am I giving to Tradition? A: No. We encourage you to give directly to your HBCU, an organization of your choice or to our 501c3 nonprofit partner, The Atlanta HBCU Alumni Alliance. Find schools that will benefit from MY HBCU Giveback day via the Atlanta HBCU Alumni Alliance (https://hbcualumniatlanta.org). Q: How does my purchase give back? A: With every Tradition® sale every day of the year, a portion of the proceeds specifically benefits the College or University through our Licensing Agreements. Q: Are you a non-profit? Is my donation tax-deductible? A: Tradition does not accept donations but our 501c3 partner, The Atlanta HBCU Alumni Alliance, is a non-profit (please click here for more info on the Alliance). If you plan to donate to another organization, make sure they are a qualified charitable organization by going to https://charitycheck101.org. Q: How do I give directly to an HBCU? A: Every school has information on how to make a donation on their website.